Home » For the Record » PUSH Spotlight: iSUPPORT my mu’f*ckin’ homegirls! Congrats to my @TerriShrmn for her Women of Hip-Hop Honor! There are times when I look around and conduct inventory on my “stock” (my grandmother’s country-rural terminology for relationship and friends) and I can say that more often than most my stock remains consistent. As I mention time and time again, women in this industry do too much belittling and not enough supporting of each other and each others movements. I couldn’t be more proud to see my comrade and friend, Ms. Terri Sherman of SEE (Sherman Entertainment Enterprises), The Sessions & The Sessions Remixed and LEX Promotions & Marketing receive such a blessing and honor for her role in music and hip-hop. SOHIPOTOME Women In Hip Hop is pleased to announce the first Honoree for 2010. Terri Sherman started working in the music industry in 2004 for the Northeast Florida Record Pool as the Director of Public Relations. Currently Ms. Sherman is the CEO of Sherman Entertainment Enterprises. A subsidiary of her company is The Sessions, a premier event for music producers. The Sessions has garnered participation from Jon Wilkes (drummer from the band Red Jumpsuit Apparatus); Maestro (Grammy Award-winning producer); Keith Kennedy (VP of TJ’s DJ’s Record Pool) and many others. In addition to running her own company Ms. Sherman works for Lex Marketing and Promotions. Lex Marketing and Promotions is the top marketing and promotions company in Florida. Speaking of her many roles, Ms. Sherman says, “I have enjoyed every position I have played in this business. Each stop along this path has prepared me for the next so I feel that everything I have done has been necessary to position me where I am now. I love what I do—that day that I no longer love it will be the day that I walk away.” Equipped with invaluable experience and relationships, Ms. Sherman looks to continue making strides in the music and entertainment industries. To learn more about The Sessions Producer’s events click here. 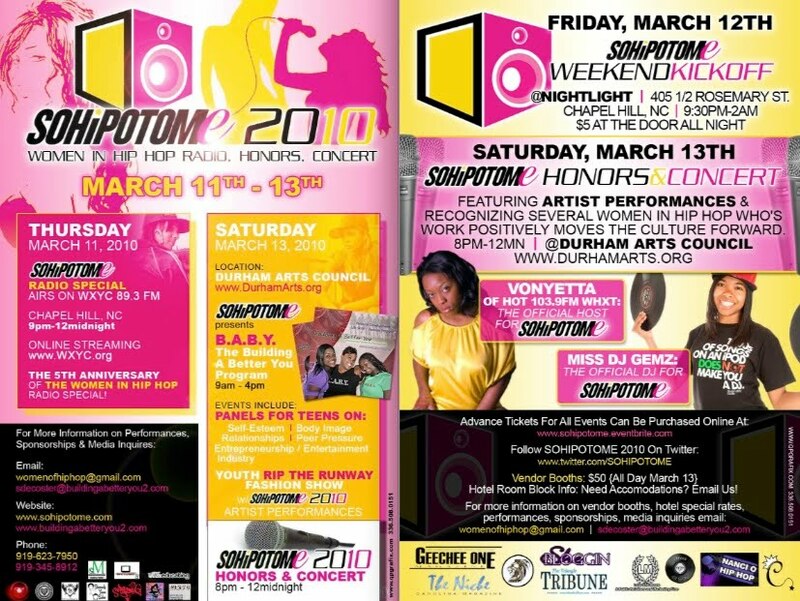 For more information on 2010 SOHIPOTOME events email womenofhiphop@gmail.com. 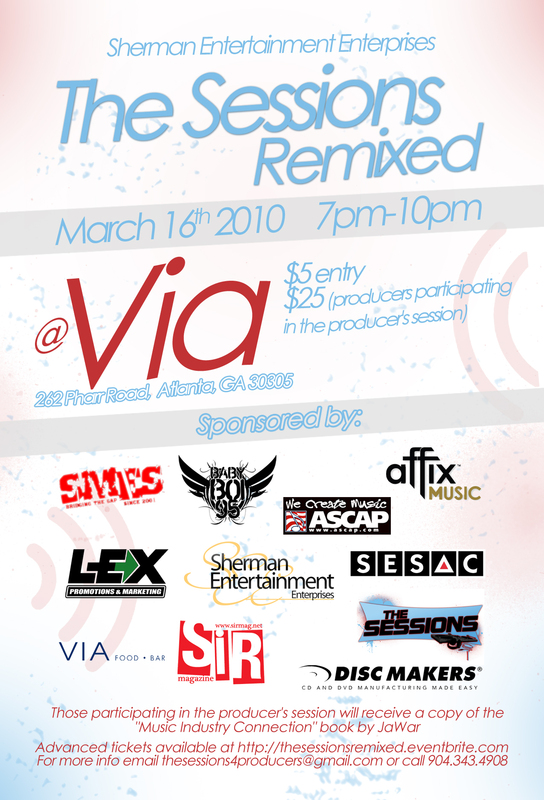 Also, below is the press release + flyer on her upcoming event, The Sessions Remixed, that will take place next Tuesday @ Club VIA in Atlanta, GA.
We’re excited to announce a new event to hit the Atlanta area, slated for March 16, 2010, called The Sessions Remixed, presented by Sherman Entertainment Enterprises, to be held at VIA (262 Pharr Rd, Atlanta, GA 30305). This event will combine the efforts of several companies and organizations to enable those already involved in, or those looking to be a part of, the music industry by slightly altering an already existing event—The Sessions. The event will have three primary segments with each segment lasting 45 minutes. There will be a networking mixer, the music producer’s session/panel presented by ASCAP, and the music business seminar given by JaWar. These combined segments will equip attendees with quality information through an interactive platform, thereby increasing their interest in and retention of the information given. Panelists for the ASCAP music producer’s session include Focus (The Game, Busta Rhymes); Maestro (Lil Wayne, David Banner); Nitti (Yung Joc, 8 Ball & MJG); Terrence Battle (Jennifer Hudson, Toni Braxton); and Simon Horrocks (Affix Music-Urban Music Licensing for Film/TV). The music industry event scene is saturated in the Atlanta market; however The Sessions Remixed will provide a meaningful environment conducive to the successful exchange of information and resources. Through this exchange, attendees will effectively be able to promote their materials, services and products. Those that purchase the “Producer’s Session” tickets will be given an autographed copy of one of the Music Industry Connection books by JaWar. They will also be granted one, one-minute track play as participation in the session. Additional track plays will be available for an additional $10/track. Any additional tracks should be one-minute as well. All tracks should be on an audio CD in mp3 format. The $5 general admission will also be available at the door the night of the event. The Music Industry Connection book series will also be available for purchase during the event. For further questions or information, please email thesessions4producers@gmail.com. And don’t forget to tell her who sent you!